Tortugueros Las Playitas operates the World's only Sea Turtle Incubation Greenhouse. It was designed by Biologist Elizabeth Gonzalez Payan during her eight year Leatherback research at Agua Blanca, Todos Santos, Mexico. 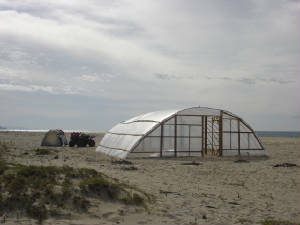 The greenhouse elevates the cool winter sand to ideal temperatures for sea turtle incubation. Without the Incubation Greenhouse, Leatherback nests in this region fail to incubate or produce very few hatchlings. Olive Ridley and Black nests laid after October 1st often produce hatchlings with flipper deformations, crooked beaks, and blindness. The Incubation Greenhouse stabilizes temperatures and significantly decreases the occurance of these deformations. The technology used in the Greenhouse also allows us to closely monitor temperatures and balance gender ratios of nests.